What is Google's Password Alert Tool? 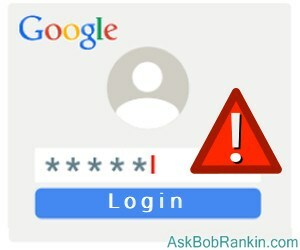 “In short, anyone looking to launch a phishing attack against a Google account simply needs to add those seven lines to render the Password Alert protection useless,” Moore told Forbes in an interview on May 1. Perhaps Password Alert should be returned to the development department and entirely re-designed. It should not be necessary for me to go change my Google password “immediately” or ever. If Password Alert knows that I am not on a legitimate Google page and that I just entered my Google password, it should not allow that password to be transmitted to the phishing page, unless the user explicitly overrides the warning. What is so difficult about this? Is your password easily guessable? See my related article Is Your Password Strong Enough? to find out if a 10-year-old can guess your password. Are you using Two-Factor Authentication? It sounds geeky, but it's actually easy to do and very important. See SECURITY TIP: Two Factor Authentication to learn how. Password Alert (when it works) also prevents re-use of Google passwords on otherwise legitimate sites, a good security practice as far as it goes. However, it won’t stop me from using my bank site’s password on a bogus site, or Netflix, or Facebook, etc. “Use a unique password on each site” is good advice that could be enforced by Password Alert or something similar. So far, just over 70,000 users have downloaded the Password Alert extension from the Google Chrome Web Store. I don’t believe Password Alert will be a runaway hit. But those who are using it should be aware of its limitations and vulnerabilities. Just to be clear, using the flawed Password Alert does NOT make you any more vulnerable to malware attacks. If anything, it makes you marginally safer. The problem identified by the researchers is that the warnings normally presented by Password Alert can be "silenced" if the webmaster of a malicious site adds additional code to block them. So even the current version (assuming it's not fixed by the time you read this) is beneficial in the sense that it will warn you against re-using your Google password on non-Google sites. It will even work on malicious sites that have not added the blocking code. Chrome extensions update automatically, and I expect that Google will give this full attention over the next few days. So I still think it's a good idea to install this one, especially if you tend to be sloppy with password reuse. Most recent comments on "Install Google Password Alert?" Just use Lastpass and you won't need to worry about phishing attacks, as Lastpass will not fill in your password on a phishing site. Roboform, 1password, and others probably do the same (although I do not have personal experience with those password managers and cannot say for certain). I read where password managers that use the clipboard also have issues, as it's easy to monitor the clipboard for password info, capture it and send it off to who knows where. Not interested, in this Extension for Chrome or Google. I have Lastpass, plus Avast!, which let's me know, that I am at a BAD website. Avast! will block any website, that isn't deemed GOOD. Basically, password alert should simply alert you that you are on a phising, or other suspect, site. On another note, what do you think of the Google Chrome extension Sidekick? Worthy add on, or just an invasion of privacy? Is this problem strictly with Chrome? EDITOR'S NOTE: This is not a problem with Chrome. This is a benefit of using Chrome, which is not available to those who use other browsers. Does my use of Google's Two-step verification provide any security against this? EDITOR'S NOTE: If by "this" you mean the Password Alert tool, then let me clarify... This article was not about a security vulnerability. It was about a tool to help you be more careful with your passwords. If by "this" you mean the possibility that you might accidentally expose your Google password by entering it on a phishing site, then yes, two-step verification will protect you because the phishing site owners would need more than just your password to login.